The EG14-1T8 FG is designed for applications that include general lamination, rough service commercial, industrial, and retail environments. 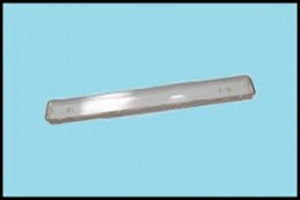 This fixture is ideal for any nonhazardous location application that requires a wet location or dust proof fixture. The EGI14-1T8 FG is a “made-for-purpose” enclosed and gasketed fixture (not a strip installed into a housing) constructed of Glass Reinforced Polyester (housing) and Acrylic (diffuser) material. Silicone gasket between housing and diffuser. Internal metal ballast/gear tray and reflector is white powder coated after fabrication. Rotary lock lamp holders for positive lamp contact. Quick disconnect is included for ease of installation.